Very long time between entries, so I thought it may be time to add one more.. 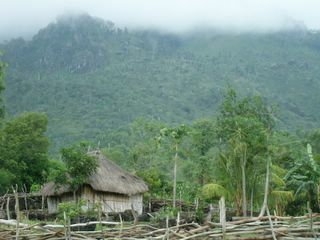 I have just returned from a week in Oecusse, a enclave district of Timor Leste which is seperated from Mainland Timor. The week was spent preparing for and undertaking impact monitoring training, quite an important concept as it attempts to identify whether our programs (and other organisations' programs) actually make a difference in the lives of the community members. Things are moving along well, and the months are now counting down rather quickly... Earlier on in the year I visited Oecusse and observed the nutrition activities. Currently, the kids' nutrition levels are still very low, as a result Oecusse will be the target of a number of supplementary feeding programs, indcluding a large scale program from the World Food Programme. 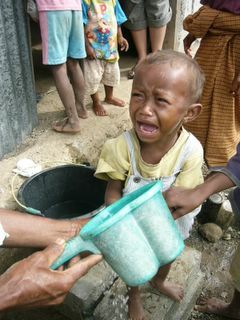 43% of children under 5 being malnourished. Not the best statistic. 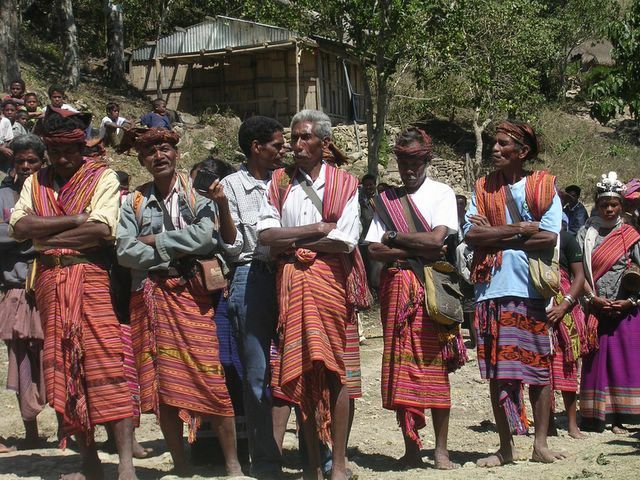 Timor is also moving into another phase. 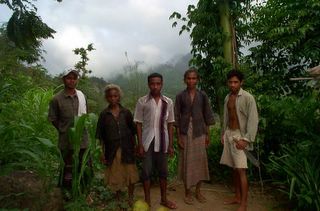 The previous UN mission in Timor Leste (UNMISET) has finished, which includes the international military forces. Now, for another year Timor will be supported by the UN Office in Timor Leste (UNOTIL). Okay, an extremely quick update. I have just returned from more or less another week in the districts. Again these are the times which I really enjoy here in Timor. But there are more reasons to be celebrating at the moment... I have a baby brother..
Great news to get. I havent yet seen any photos, but as soon as I do im sure they will make their way on the site here. So have a little toast to Charles (Charlie, Chuck or Chukles.. maybe not) when you get the chance. The week away involved a few trips to communities to once again observe Oxfam’s nutrition activities, except this time I forgot my camera- which was abit of a shame. The countryside in the district of Suai is gorgeous, so I took the opportunity of grabbing the motorbike and having a look around myself. So of course now I have dreams of biking around timor and visiting some of the less travelled roads- occasionally roughing it, but more than worth it.- Anyone keen? Tomorrow we will also meet the new group of Youth Ambassadors, which means around 10 new faces, of course something we are excited about. I have just returned from more or less another week in the districts. 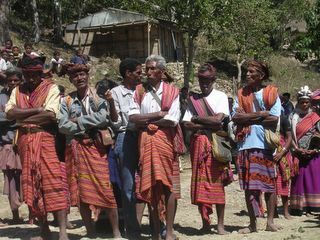 Again these are the times which I really enjoy here in Timor. But there are more reasons to be celebrating at the moment. I have a baby brother..
My apologies for not writing sooner, as i just wrote above, everything is moving extremely quickly. 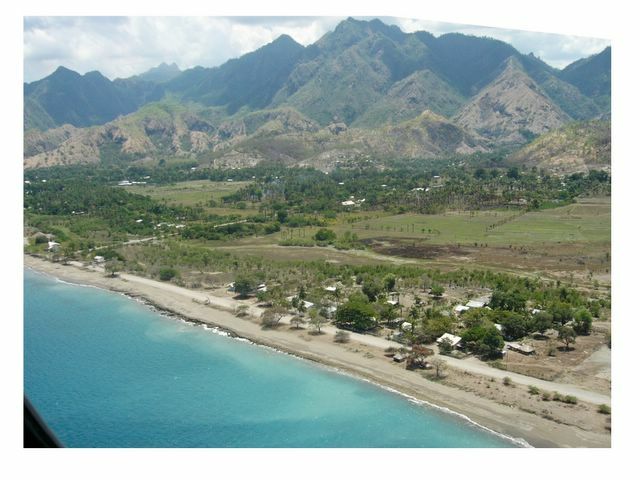 Well for the most part of the last while, i have been based in Dili (but should make it back to the districts over the next 2 weeks). Of course Easter has just passed by. We spent ours camping on the eastern tip of the island of Timor. 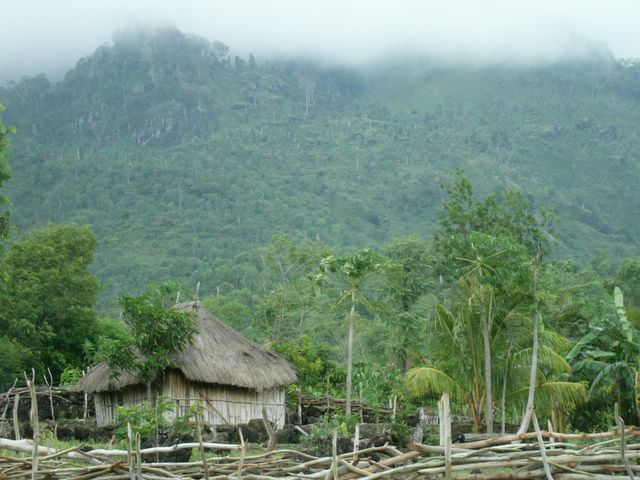 As many who have been to Timor would know - it is an absolutely stunning place. Just think of the typical tropical island picture, and add in amazing snorkelling. Coral, blue water, fish and all the rest. So.. out weekend was spent sleeping in mossie nets on the beach looking over an island. The fish is cooked up by the fisherman who also ferry you across the channel to the island (Jaco)- which is the place to go snorkelling/diving. Or course there were the other points of having to dive into the car as it bucketed down through the night, and coral cuts are bloody fantastic. But generally.. i would be recommending this place to anyone. On a slightly more 7 year old side, there is an abundance of hermit crabs. I challenge you to have a hermit crab race and not have convulsions from laughing, although im sure the local 'tua' helped in our jolly mood. On the other notes, the combination of work and university is getting interesting. (as im sure others would know). I am currenlty house mate less... the 2 others that i live with are currently travelling (photos further down). Kate is back home in aus for a week, and Kit has made her way to an all expenses paid trip to Hong Kong for a job interview. Not bad for development work. People continue to come and go aswell. Although in the big picture, a year is not long at all, so even we would fall under the 'quick visit' category. The whole region seems to still be quite vulnerable re the earthquakes. Especially with the earthquake today in Indonesia, we have also felt one or two other smaller ones over the last month or so. I have been able to attend some disaster management conferences/ workshops. Very interesting to attend these as it gives a 'realistic' viewpoint of what the potentials are in the region... potentially unsettling thoughts to think about. I would have thought there would be much to talk about. But besides the recent trips away and work during the day... theres not much more to report on. Will be keeping this updated more regularly... ill try. It is sunday afternoon and i have found myself at work.. probably wouldnt be needed if i would be more productive during the actual working hours. 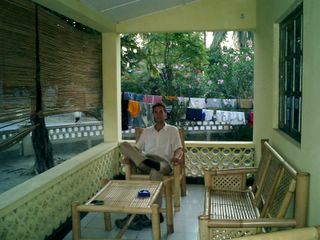 The week gone by has been more or less a usual week in Dili.- but alittle more exciting than usual i would have to say. I am preparing to go back to the districts from tomorrow (monday), and return on friday the 25th. In the past week, there has been more or less an exodus of people leaving our house. We have gone from 7 people living on the house, back to 3. Two brazilian fellas have gone back home, another volunteer has started her placement and moved out to a district called gleno. A little puppy also passed away. Which was quite sad, especially in the way it all happened, but the culture here is of course different in some ways, so all you can do is as much as you can, yet accepting the realities of how certain things work. On another totally unrelated and useless point, a shipment of food from australia found its way to the supermarkets complete with milk and proper yoghurt. This shipment actually comes most weeks, but i always seem to get there after all the good stuff has already been sold. i have therefore had over 4 glasses of full cream milk- with milo today... the small things, but as i said, just alittle bit of useless information. I made my way to a health clinic during the week. That was also a new experience. Althougth when i am in the districts the scene is quite different, here in Dili the oxfam office is complete with air con, internet, and most computers run properly (most, not all). Going to the clinic was a slightly different experience. It is called Bairro Pite clinic and i was able to have a look around at the workings. I was able to help out in one of the rooms where the dengue tests were occuring. Half a dozen or so kids were needing to have dengue tests. When looking at the chart its never good to see that there are about 3 out of these children who have been listed positive. Not so good. The little dengue outbreak i think has now has some attention from the World Health Organisation. 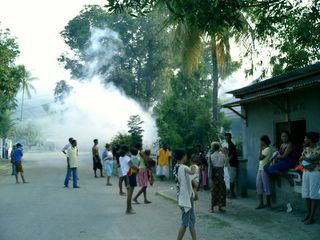 Currently, there have been around 150-200 cases of Dengue Heamoraghic fever, primarily in Dili, and with a relatively high mortality rate of 9.1%. Quite scary when you look at those statistics. So Dili has recieved a 'crack' team of epidemi-somethings and virologisits to assist with the treatment, as the high mortality rate is primarily due to mistreatment, rather than the dengue itself. A group of us made it to a belated valentines day party last night. And for some bizarre reason, the hosts thought it would be nice to have the 'tall malae (white person) in the white shirt' to come up and 'say a few words to the person he loves here tonight'... (in tetum)I suppose it was a valentines party afterall, yet maybe the group didnt really think about what that entailed. Wasnt the most comfortable situation, but abit of a laugh afterwards. So i did my best not to make a total fool of myself. This was followed by a few hours of dancing. Yet dancing where you are not allowed to smile (or more that no one smiles at all), and as soon as the song is finished, the sea parts and everyone sits back down again, to wait only until the next song starts, where the males ask the females, and it all starts again. Quite enjoyable when you learn to master (or just think youve mastered) the timorese 3 step. Hope all is well, and my best wishes to those who are making trips of their own soon. Well, as you can see, I have finally figured out how to post up photos. So i worked myself up into a bit of a frenzy and posted quite a few up. But i will restrain myself more in the future. Not much to report on in the last week. Have been quite busy with catching up on work, and am actually in the office on a saturday for 2 weeks in a row. But maybe not to good in the long run though. Alot of the photos just posted up were of the nutrition program i accompanied a few weeks back. We are conducting another one soon, and slowly expanding to cover more areas, and as its the first time we have organised one- called a 'hearth', we can improve quite alot for the future. One minor detail, our house has now acquired a tv and dvd, passed onto us by our Country manager before she leaves. Could be dangerous though when the thesis kicks in. Ok, just a quick update. WIll have some more news later. I am back from another field trip. Which would have to be ranking up the top. There were a few Oxfam staff who visited a district called Oecusse, an enclave in East Timor, which is situated in the west and actially surrounded on 3 sides by Indonesia, and the other side by water. Oxfam were running a nutritional program due to some recent surveys showing relatively high levels of malnutrition in children aged from 6months to 5 years. 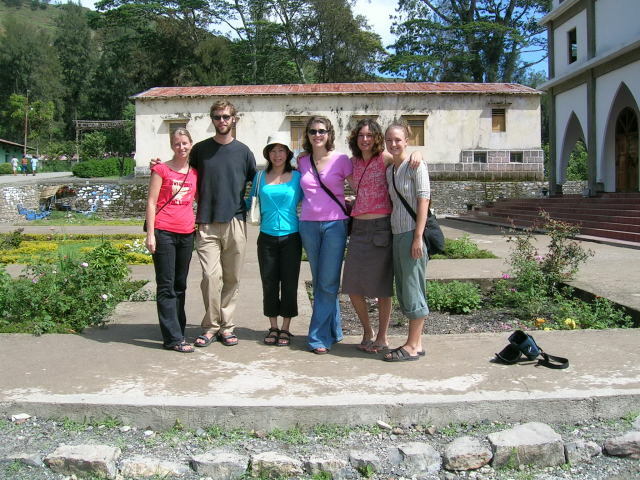 The program involved us visiting a small community in the mountains in Oecusse. Absolutely gorgeous. You are surrounded on all sides by mountains, but very basic aswell. Within each cluster of houses, there is a communal water source, electricity isnt available, and the housing is a mixture of tin roofs and bamboo stalk walls, to the traditional style houses with the thatched roofs going all the way to the ground. 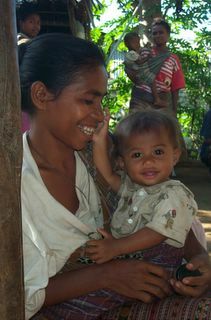 Each morning certain mothers and thier children would gather and we would conduct nutritional programs. Which basically meant a group feeding session, intertwined with health messages. The approach used is called 'Positive Deviance', but i will save that explanation for anyone who wants to know, rather than mumbling on. But of course if anyone is interested for more onfo, just ask. 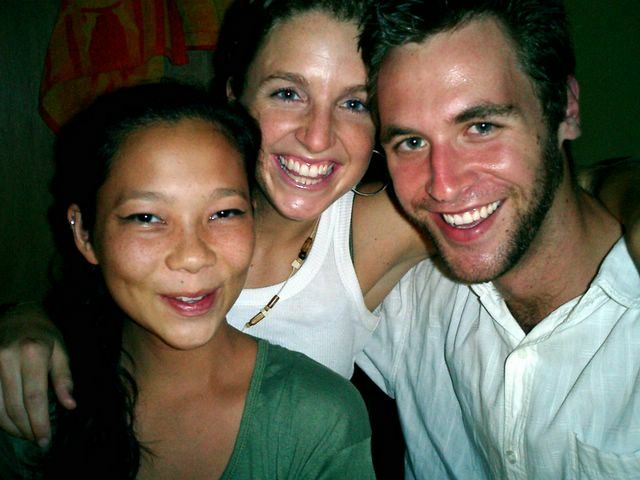 I was lucky enough to stay with a timorese family for a few nights aswell. Sleeping on tarps, attempting to comunicate in Bahasa, gathering water and attempting to help out with the meals made up most of the afternoon. It was interesting to see how close they are to the land. For example, to have a meal, you have to pound the husks off the rice, sift the rice to leave only the 'white bits' then do the usual cooking. The vegetables are picked from the garden or surrounding area- mainly pumpkin leaves or cassava leaves mixed with salt, and then if meat is on the cards, you do it yourself of course. It was funny actually, a few mornings before we left, they were preparing a party for us, so i saw one of the eldesmen of the community grab himself a spear, saying, 'i am going to hunt pigs'. Within the family, there were a few small children who had relatively bad foot infections, one child has burnt her foot, the other had stepped on a thorn and gone a fair way through her toe. There wasnt much in the way of medicines or antibiotics around, except for an orphanage about an hours walk away. 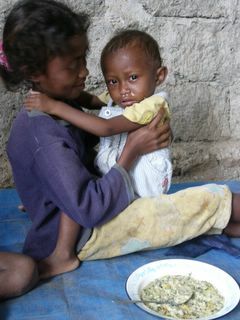 The children were struggling walking with their infections, so two of us ended up carrying then to the orpganage. This orphanage is run by an american priest who has been here in timor since the 1960's, so needless to say he is definately regarded as one of the community. He also took part in physically defending the orphanage when it was attacked by the Indonesian military. The village also put on a party for us on the last night. Which involved someone bringing a tape recorder and some older tapes. THe elders of the village (called 'catuas adat'), asked if i would like to share a drink with them to celebrate. Of course my initial thoughts were of a good cultural experience as these guys hold the traditional authority in the community and i am hoping to return there for study later on. Yet after one drink of locally made quite strong alcohol, i realised that i couldnt leave 'the cicrle' until it was all finished- 2 litres. Not the best result the next morning obviously. I am hoping to sort out how to put up some photos on this site for you to see, as its definately worth having a look at the community, and the countryside. 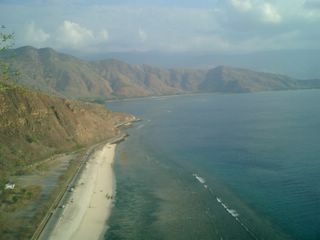 Back in Dili now, which is nice. Yet there have been some strong health warnings by the ministry of health (this was done by driving around in cars with loudspeakers). Dengue has quite a large presence in Dili, and over 80 people have contracted it, a few friends and the Youth ambasador manager, so we all have to be abit more careful in regards to keeping the mossies off us. 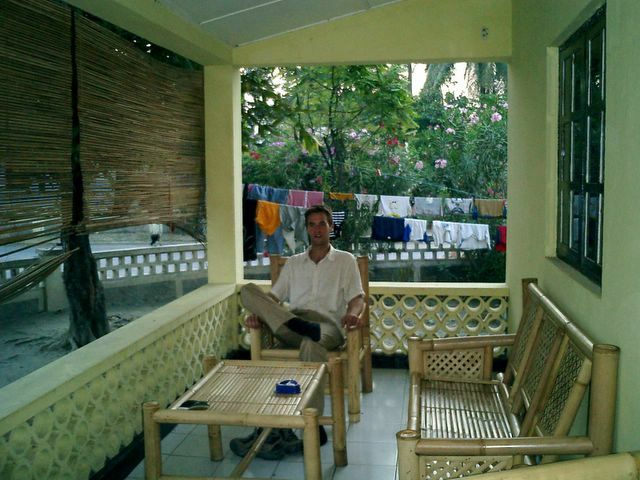 Other than that, back to the life in dili. My supervisor arrives back from Aceh later on today, so i look forward to some interesting chats and the health is fine. Now that i am back in communication, ill catch up with you over a personal email aswell, but dont hesitate. I have just returned from the first district trip of the year. I visited a district called Suai. Had been there once before last year, but its a great place and i will try to get back there more and more. The trip only last 3 days, but ended up being quite busy. The plan for the trip was to update the information we have on the programs that are running in the office and subdistricts down there. And of course wanted to stay. 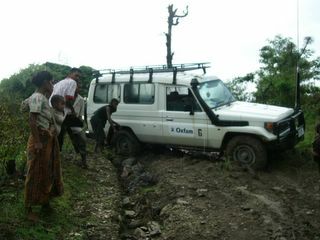 After the 1st day of work, i was given the Oxfam car to use during my time there. So i took the opportunity to drive to the beach, about half an hour away. I had learnt my lesson not to swim there last year. 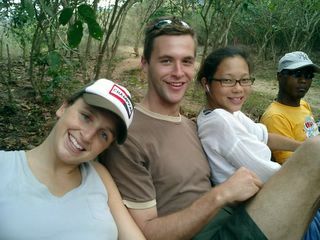 (We saw crocodile tracks go into the water last time just as we got out) So the plan was to keep fit and go for a run. 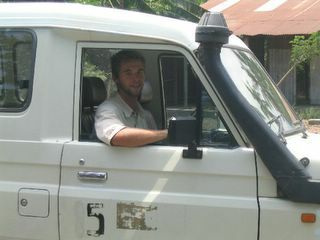 But After the run (unfortunately no crocodiles), of course the car wouldnt start. I was getting slightly worried as it was getting dark, i didnt know the area, and the fact that i was by myself with no idea how cars bloody work. It all worked out as i walked for a while and found a few timorese relaxing at the beach. They gave me a push start and i eventually found my way back. Not too many other stories, a rather large spider hiding in the hollow of a toilet role as it 'was in use' was abit of a surprise. And a planned meeting with the staff in the districts turned out to be a training i had to somehow conduct, which put me on the spot abit. Its now friday afternoon, so have the weekend to go before another trip. Lucky enough to have this next trip for over a week. Also, on a sadder note. It has been confirmed that a youth ambassador was killed in Thailand by the Tsunami on boxing day. Her name was Susan Oliver, she was taking a holiday over Christmas from her post in Vietnam. Please keep Susan and her family in your thoughts. Take Care, and thanks for the little comments posted up. Ill definately be keeping you updated on this end- so keep any news coming.